Recently, FacingDisability.com began an interactive Facebook quiz called, “What the Heck is It?” – a game that asks our fans about simple pieces of adaptive technology to see if they can guess what they are. 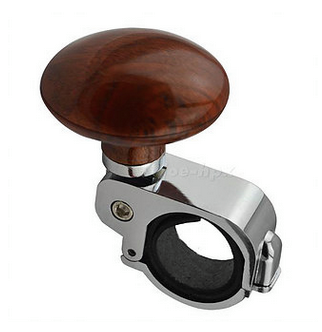 One example is this image of an adaptive steering wheel handle. It got people talking. Even though the object was easy to guess, it prompted lots of arguments about using it. Some thought it was too dangerous, while others said they couldn’t live without it. This single post brought almost 90 comments. The responses reminded us that the way adaptive technology is used is highly personal. What makes the wide range of adaptive technology available today so necessary is that not every person with a disability will like using the same adaptive tool or will use it in the same way. That’s why we think it’s important to make note of the latest and most ingenious inventions in adaptive technology on our website, blog and our Facebook page. By the way, we love it when people disagree about an adaptive device or how to use it. As any occupational therapist can tell you; “A beautiful adaptation is in the eye of the beholder.” Nothing works the same way for everybody. FacingDisability.com has a Facebook page that has over 5,600 followers and regularly posts links to important articles and topics about spinal cord injury and other topics closely related to living life in a wheelchair. Many of the links are to our own videos and articles we are proud to have written and produced. In a world in which almost all health care organizations are working to increase their online presence and user engagement through social media, FacingDisability.com is happy to glide right along with them to bring important, new information to our regular and new visitors.